Would you rather buy an apple on your own in a grocery store or from a street peddler pushing his best produce into your personal bubble? Have you ever asked a cold-call salesman to remove you from his list or actively put your name on the Do Not Call Registry? Very few people enjoy being “sold to” these days, or at least they prefer to do their homework and buy something in a way they’re most comfortable with. Inbound marketing shortens the top of the sales funnel. It’s a practice that aims to educate leads and potentials so they are qualified, informed and ready to buy before speaking to a representative. A company can go about this by capturing lead contact information and nurturing that lead by targeting blog posts, landing pages, e-books and more content to each buyer persona. To echo one of Cinda’s recent posts, the average B2B customer moves nearly 60 percent of the way through the buying decision-making process before they engage a sales representative.1 Giving your potential customers easy access to valuable information can help them reach the level of understanding they need to initiate a conversation with you. Inbound marketing can be defined as creating interesting and informative content on your website that will draw inherently qualified and educated leads into your sales funnel through marketing automation. 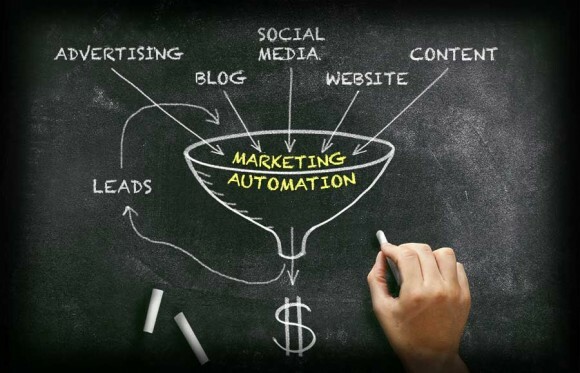 Marketing automation utilizes precisely staged workflows to deliver content at the right moment to keep leads coming back. A number of tools are available to help execute automated inbound processes, notably HubSpot and Marketo. HubSpot provides marketing automation that allows a company to manage leads, buyer personas, blog posts, email marketing, landing pages, social messaging, forms, calls-to-action, competitors and analytics all in one interface. Marketo is very similar to Hubspot, while also offering up-sell, cross-sell, loyalty marketing and event marketing add-ons. WordPress can also be built to assist with inbound automation tasks. All of these inbound services cost money, so how does one justify spending precious marketing dollars on a seemingly simple tool? The answer is ROI. Every marketer wants to improve ROI, and inbound marketing increases ROI in a big way. Inbound automation increases traffic to your website and blog and helps you capture qualified lead information. With the right handling once leads enter your sales pipeline, inbound traffic should translate into increased sales. At SCORR, we’ve had an increasing number of new clients approach us with HubSpot or other automated inbound marketing tools somewhat integrated into their mix. While it’s something we welcome with open arms, it should be noted that inbound marketing tools are not replacements for your current marketing activities, but rather a way to better accommodate your content to your audience. Content and sales strategy are still the drivers behind lead conversion. Great post Jake. I’d be interested in another post talking about how SCORR bridges the gap between content and sales strategies and inbound marketing. I’m familiar with Hubspot and know a few people there. IMO they are world-class in terms of their marketing strategy and solutions. I think the shift towards inbound marketing will accelerate in the near future as companies stress user experience and content marketing more and more. The difficulty in both is quantifying ROI for those companies or clients that want to measure as granular as possible. 100% agree that these inbound strategies are best leveraged as complementary marketing activities. Good post, Jake! Shane: Great idea for a post (keep them coming!). Merging sales and content marketing in any B2B company is definitely the goal of inbound marketing, as it aims to shorten the sales funnel by bringing educated and motivated buyers directly to the sales team. I’ll try to put an article together surrounding that process. Thanks, again. Jeremy: You’re absolutely right on all points. If I were starting a company from scratch, I would use inbound marketing from the get-go, but already-established businesses see the major changes required by their sales and marketing teams and opt for the features they see as valuable, such as marketing automation or lead nurturing. I feel strongly that pioneering the move to inbound marketing within a slow-to-change industry will lead to substantial long term benefits in both sales and client retention. Do either of you have any direct experience with inbound marketing in your day-to-day work? I’d love to hear your perspectives. I definitely agree that inbound marketing isn’t a stand-alone strategy; but rather a cost-effective accompaniment to the established tenets of digital marketing. In essence, it’s just a differentiated form of content marketing – and that’s always offered an amazing ROI. I’d even put money on ‘inbound marketing’ disappearing within the next couple of years, as it’s largely an exercise in re-branding from HubSpot – and they’re already in the process of shifting away from marketing towards a more holistic ‘inbound’ approach! Great read, thanks for posting!